My poor poor Mazda3 hatch. I’m a third to this party. Pathfinder at fault. Turns in front of oncoming traffic, gets smacked in the right rear (ripping the suspension out of the chassis and blowing both airbags) and spun 360 before it begins to roll backward in an arc into my front. The car doing the damage got a total frontal Hulk smash job. A few thousand dollars of damage for sure to me. 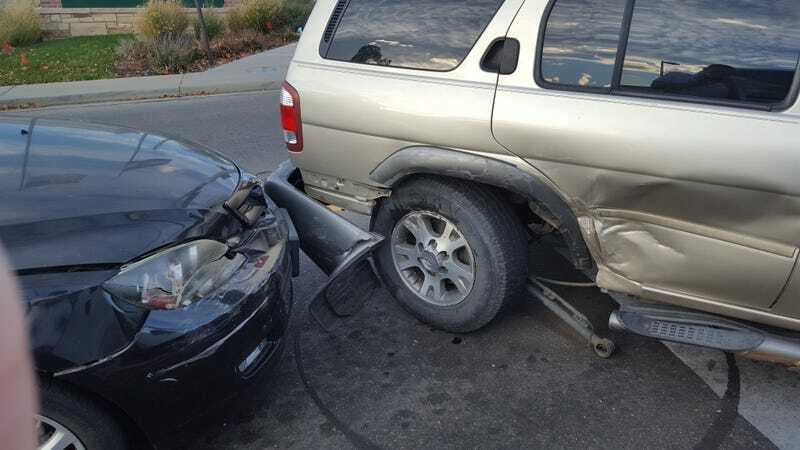 Bumper, Headlight, fender, hood, hood hinges skewed, rear bumper - as it pushed me back in another car behind. The car drives straight and no leaks as of yet. But I only have a high beam at unknown alignment to use in the dark. Anyone with first-hand experience in getting American Family Insurance to pay up? Deciding who to file with, my guys who have always treated me fair, or AFI? If I file with my guys, they pay out quick, etc, do the proper thing and then send AFI a check to subrogate them. I file with AFI, I’m sure they’ll drag it out long enough until I get tired of it all and settle for less than I should. Anyone with first-hand experience with the other side of AFI?